2-1/2" Acoustic Eggcrate Foam - Charcoal - 72"x80"
For people who want the increased sound-deadening qualities of 2-inch wedge foam, eggcrate foam performs well while saving you money. With our 2 1/2-inch charcoal eggcrate foam, you achieve the effect you need with ease and affordability. The reason this type of foam is a favorite is because it keeps the price down without compromising on the quality. 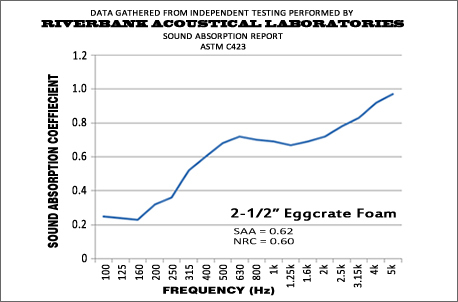 This type of 2 1/2-inch eggcrate foam is the perfect solution for someone in need of soundproofing on a budget. While it can be used for a range of applications, the nature of it makes it ideal for people planning to cover their dampening foam with acoustical cloth for an added buffer. We offer this reliable foam solution in the standard size of 72" x 80" to meet your needs with ease. This option is a little bit thicker than our others, so it provides even better soundproofing capabilities. The unique shape of the foam makes it especially well suited to dampening sound vibrations which makes it ideal for spaces where you need to create a quieter environment. If you have any questions about any of our high performing foam solution, please Contact Us. We are always happy to assist you in finding the right solution for your exact needs.